Many of the facilities that visitors to the Air Tattoo use are gathered together at a 'Service Station'. We have three Service Stations; one located in each of the coloured zones and many of the same facilities are also in the Vintage Village. 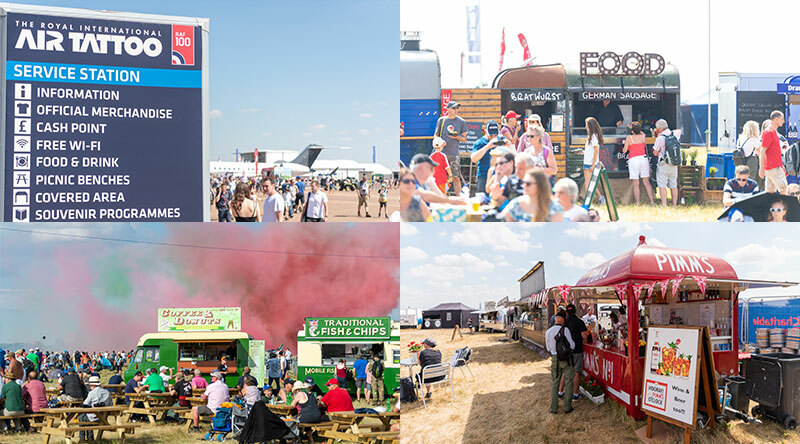 In the food court you can sit at one of the numerous picnic benches, either under cover in a large marquee or outside in the sun, and enjoy vegetarian, organic and salad options, Asian cuisine or a pizza; alongside a traditional burger or fish and chips. Also located at the service stations are visitor information points, official merchandise and souvenir programmes, cash points and free WiFi. The Vintage Village offers similar facilities to the Service Stations. Those marked with an * are also available in the Vintage Village.